Radishes are polarizing. In my experience no one is lukewarm on the subject of their love or lack thereof for radishes. A friend recently described them to me as “tasting like spicy dirt”. I am on a mission to bring radish love to the WORLD, friends, because I assert that most people who think they hate them have just plain been eating them wrong the whole time. Full disclosure: I love them raw. They’re crunchy, they’re make-your-eyes-water-and-nose-run spicy sometimes, and they’re funky. Slice them in half, smear with butter, and sprinkle with salt. Personally? That dings my chimes. That being said, I get why a lot of people don’t dig them. (Get it? Dig them? Roots? I digress.) Here’s the thing. If you roast them (and I hope you will feel moved to do so by the time I’m done with my little pro-Radish speech here), you will turn them into something magical. 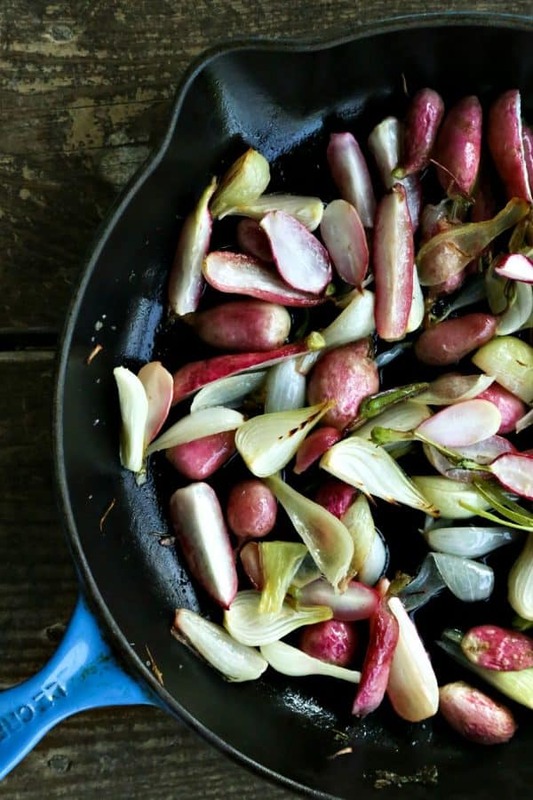 Crispy Roasted Radishes with Onions are enough to turn radish haters into radish lovers. Courtesy of that alchemy that transforms vegetables while they roast, that spicy, crunchy, pungent little ruby orb is turned into a tender, sweet, crisp-on-the-outside, mild (YES, I SAID MILD) bite of heaven. 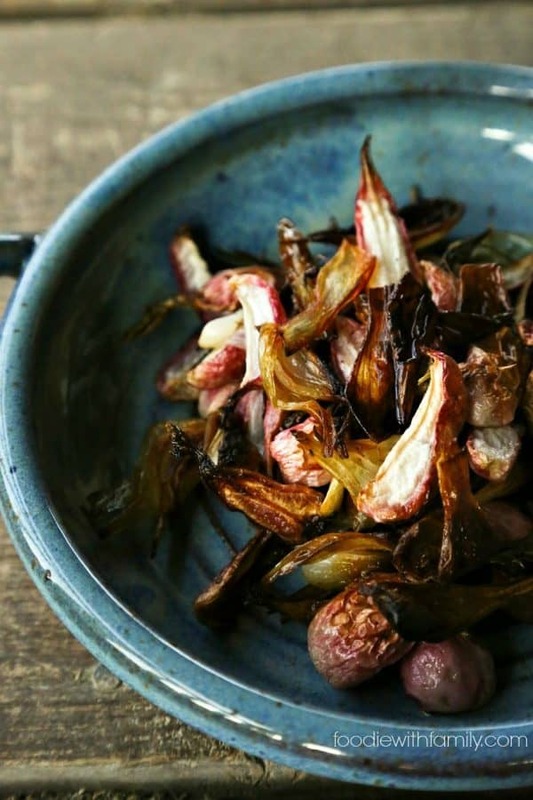 When paired and roasted with fresh spring onions, the effect is nothing short of glory. The only problem with Crispy Roasted Radishes with Onions is that it’s entirely too easy to lose track of how many you’ve snuck from the pan and run out before they have a chance to make it to the table. It’s simply not possible to make too many of these. You’re only limited by the dictum to avoid overcrowding your pan. Solution: double down on ingredients and use a bigger pan. Trust me. There’s really nothing to prepping the radishes, you lob off the leaves if you’re lucky enough to procure very fresh bunches of radishes, leaving a little stem intact, halve them (or quarter if they’re larger). If all you can find are the little bags of trimmed radishes, that will work fine, but lack some of the prettiness that the stem contributes to the end product. If you can find fresh spring onions for your Crispy Roasted Radishes with Onions, please use them. Just lob off the green portion where it starts becoming hollow. If you haven’t grown any or can’t locate them at your farmer’s market, just trim and peel some smaller yellow onions and cut into small wedges. They’ll still be delicious. Avoid overcrowding your pan. They will shrink a little as they roast, but you want to start out with them having enough room to get hit by heat on all sides. That picture above is pushing my limits a little bit, but it ended up all good. You start the radishes and onions in a higher temperature oven and then lower it to finish the process. This higher temp helps caramelize the sugars in the vegetables and the lower temp lets it become tender on the inside and crispy on the outside. Don’t be tempted to pull the pan from the oven too early. While the onions are starting to caramelize in this picture, we have a long way to go before we hit that lovely crispy stage where everything magically transforms to unicorn glitter and fairy dust. Or something like that. Just trust me and put them back in the oven if they look like this. The crispiness is what really sells this dish. 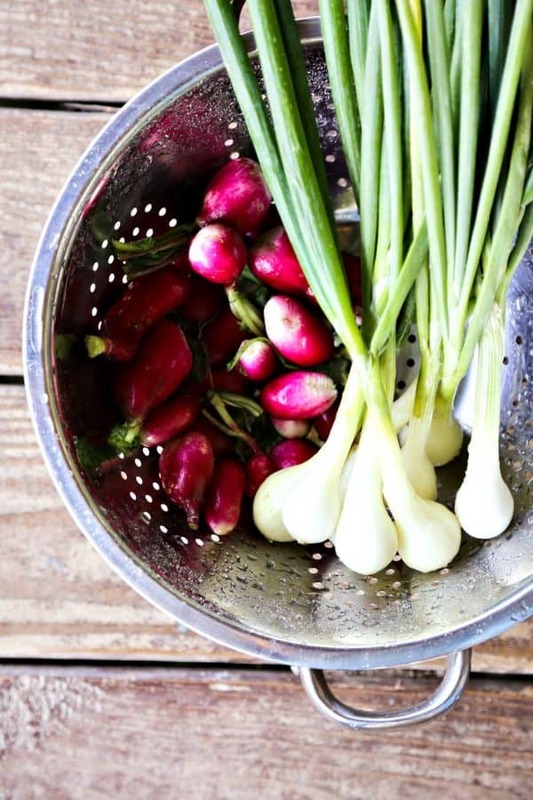 While I love Crispy Roasted Radishes with Onions the very best when they’re still warm, they’re also tasty at room temperature, making them a grand addition to any picnic basket or cool summer meal. 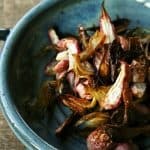 Tender, sweet, crisp-on-the-outside, and mild -yes, I said mild!- these Crispy Roasted Radishes with Onions are sublime enough to turn fervent radish haters into radish lovers! Halve the radishes or quarter any that are larger than a half dollar. Cut the onions into wedges about the size of the radish pieces. Spread in a single layer on a rimmed cookie sheet or cast-iron skillet. Drizzle the olive oil over the vegetables, sprinkle the salt and black pepper over the top and toss to coat, spreading back out into a single layer. Roast for 10 minutes, lower the heat to 350°F, stir the vegetables, and roast for 20 to 30 more minutes, stirring every 10 minutes, or until the vegetables are deeply caramelized on the outside and tender on the inside. These can be served hot or room temperature or anywhere in between. This looks fabulous. Previously my favourite way to eat cooked radishes was Laura Calder’s “Glazed Radishes Chateau du Fey” but since I absolutely love every roasted vegetable I have tried, I think I’ll give your method a try. Thanks for all your lovely recipes. … PS, Don’t throw away those beautiful radish leaves. There are lots of ideas on Google. 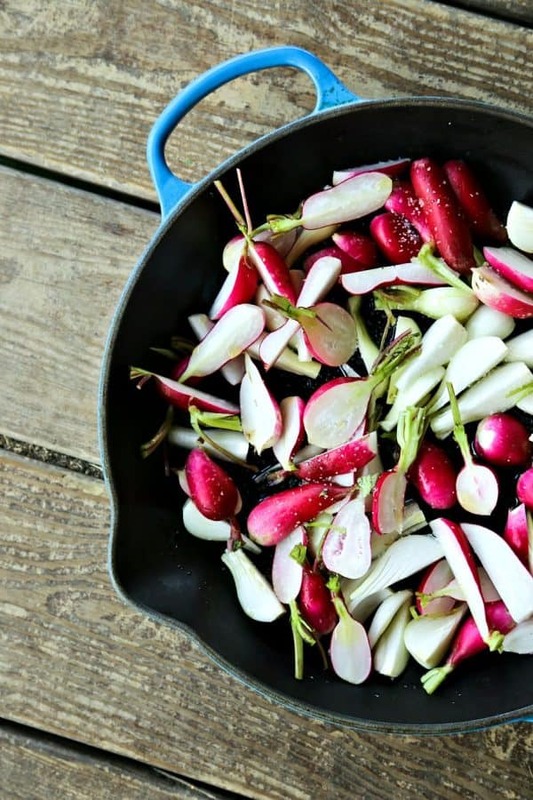 The French have some pretty amazing ways with cooking radishes – both the tops and the bottoms! We are a house divided. My husband digs them (snicker, snicker). I think along the lines of your friend. I would be willing to give this a try though. Roasted veggies are usually better. I can’t wait to hear what the both of you think! This looks so very tasty. I love me some radishes. And then make pesto from the radish leaves! I have radishes and find they are the best part of summer. Nothing beats a nice spicy radish. I will have to try this although it seems like a possible waste of a good crunchy radish to roast it but I will trust you.